Simon AKA The Chilli Jam Man started making chilli jams to spice up his food after living in Australia for a few years, where he fell in love with South East Asian flavours. When he returned to the UK he couldn’t find anything to hit the spot, so he decided to make his own. He made small batches which were soon in high demand from his friends. When the financial sector Simon worked in was hit by the recession, he decided to take the plunge and see if there was a business in it. He turned up to his first market in 2009 with 40 jars and sold out by lunchtime, so decided to make some more. Making everything in-house at our commercial kitchen in the heart of the Yorkshire Wolds, Simon now runs a small team and still prides himself in using the best ingredients. The range has picked up many National Awards along the way, including so many Great Taste Awards he’s now classed as a Great Taste Producer. He still loves going to food festivals and hearing first hand what people think about his products. He also enjoys collaborations, with one of his personal favourite’s being the fantastic ‘Mostly Ghostly’ made by The Chilli Jam Man and York Brewery. His sauces have been a huge hit with pubs and restaurants and have established the range further in the food industry, gaining several awards on their own merit. 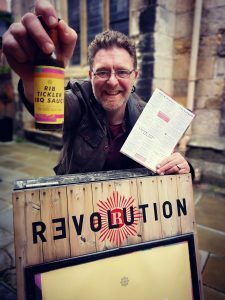 You can now find his sauces on every Revolution Bar table in the country, as well as on several of their menu dishes. With a consistent 5 star food rating and achieving SALSA accreditation in early 2016, his range has gone from strength to strength. A great eye catching range of gift items, including his ‘Chilli Bomb‘ range, have seen the brand break into the gift market with listings on the likes of Not on the High Street. Spicing up everything from sandwiches to stir fries, pasta to pizza and curries to chilli con carnes, most of his range is now vegan friendly and gluten free, which has seen sales soar. Simon’s wife Bonita (aka ‘Mrs Jam’!) is also very involved in the business. Taking care of marketing, social media and the food festival side of the business, as well as the stockist and website orders, she also makes the Balls of Steel roulette sets and Badvent Calendars on the run up to Christmas. 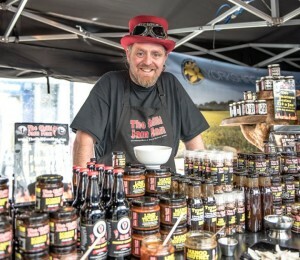 Last year saw Simon enlist the help of Jambassadors – self employed passionate foodies who sell at food festivals under The Chilli Jam Man brand. This has given Simon the time he needs to work on the commercial side of the business, as well as working on new and exciting ventures. He remains as passionate as ever about his products and continues to ‘spread the jam’ nationwide!